After dropping the conference lead to Chico State last weekend, the UC San Diego men’s basketball team has waited for an opportunity to bounce back and what better way to do it than in front of 3,783 fans on Friday for Spirit Night? 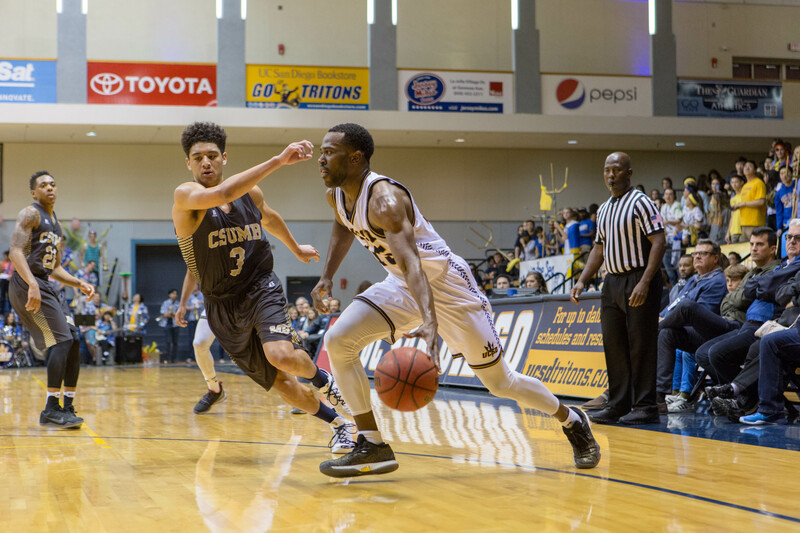 The victim, the 3–16 Cal State Monterey Bay Otters, who, despite their last matchup being a couple of shots way from being a blowout, could not do enough to stifle the UCSD offense, as the Tritons cruised their way to a 74–41 victory, despite some some offensive struggles early on. Out of the gate, the Tritons immediately started to click on offense, going on a 7–0 run that was sparked by three-pointer from sophomore guard Christian Oshita. The Otters, who looked like deers in headlights during their offensive possessions, ended the Triton run with a dunk, made possible by some Triton miscommunication. While the UCSD offense was clicking from outside early on, the Otters were determined to force the Tritons out of the paint and let them settle for long-range shots, hoping the Tritons would eventually cool off. Monterey Bay played some staunch, physical defense around the basket, so for a large chunk of the first half, the Otters were actually a couple of well-timed shots away from making it a close game. With a 12–0 point advantage in the paint by the end of the half, the Otters succeeded at implementing their defensive philosophy. Even though they only forced two turnovers, the Otters frequently got their hands on the ball and jammed passing lanes, forcing the Tritons to make ill-advised decisions throughout the half. Unfortunately for the Otters, UCSD remained hot from deep. While the Tritons went an abysmal 7–25 shooting overall, all seven of their made shots came from beyond the arc, converting 53.8 percent of their three-point attempts. Coupled with the fact the team converted 12 of 14 free throws, UCSD did just enough to pull ahead by double digits by the end of the half, even if it didn’t necessarily look like it. With senior guard Adam Klie playing limited minutes due to two early fouls, senior guard Aleks Lipovic kept the team afloat, scoring three of the seven first-half threes and forcing his way to the line twice, earning four points. When the second half finally rolled around, something — perhaps it was the extended halftime that led to an administrative technical foul on UCSD — made the Triton offense finally start to click. Roughly five minutes into the half, sophomore center Chris Hansen laid it in for the Tritons’ first two-pointer of the game, and just a couple minutes later, Hansen drilled a three-pointer and then laid it in again on the next possession to give the Tritons a 21-point lead. UCSD’s lead continued to grow as the night went on as the Triton offense simply overpowered the Otters at every opportunity. Although Monterey Bay was a brick wall in the paint during the first half, the second half demonstrated what happens when an unstoppable object meets a piece of tissue paper: The Tritons outscored the Otters 41–22 and took a 26–11 rebounding advantage in the second half. When the dust finally settled, the Tritons celebrated a 74–41 victory over the Otters. After the win — and the team’s Saturday night 84–45 victory over Cal State East Bay — the Tritons are now 17–5 overall and 12–3 in the conference, reclaiming their first-place status in the CCAA. Cal State Monterey Bay dropped to 3–17 overall and 1–13 in conference. Next up, the Tritons face off against Cal State Dominguez Hills on the Toros’ court on Thursday, Feb. 9 at 7:30 p.m.